Both the K’s stole the day as they won their teams handsomely and made it look almost one sided. To call it a revenge game within 2 days gap, both the teams met again this time in Bengaluru, This RCB was up to the challenge, even though Sun risers were able to register their highest score for this season, Kohli made it look so simple as RCB won the match with 14 balls to spare. – Cameron White Scored the 50th Six of this season IPL. – Thisara Perara went past the 100 meter mark when he crashed Henriques ball over deep midwicket it went as long as 101 meters bettering David Warner’s 99 meters. – Cameron White has also brought up 6th IPL Fifty. – Cameron White scored the 200th Boundary of this season. – 93* runs by Virat Kohli was also his personal best in IPL, he bettered 73 runs scored against Delhi last year. – 21 runs conceded by Amit Mishra is the highest ever he has conceded in a T20 Game. – Virat Kohli’s 93* also the highest score of this season, bettering his fellow team mate Chris Gayle’s 92*. – 74 runs scored by both the teams (37 each) in two overs 16 & 17 is the highest ever scored in these overs. – Before this match both Delhi & Mumbai have met 10 times and both share 5 wins each. – No.of times a Match has been won, after winning toss and deciding to bat first – Just Once. – Irfan Pathan Bowled the second Maiden of this Season. – Irfan Pathan has bowled 9 Maiden in IPL so far and now tied for top spot with Praveen Kumar who has also bowled 9 Maidens in IPL so far. – 13 Wickets by Irfan Pathan is the highest by any team bowler against Mumbai Indians. 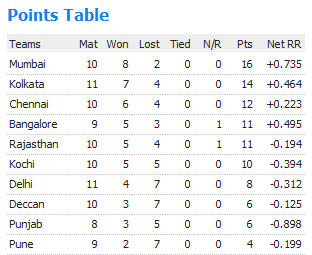 – 209/5 by Mumbai is the highest score for this season of IPL, bettering 165 runs by Rajasthan Royals score by a mile. – Orange Cap has been shifted three times in a day, First Gayle had it, then Kohli followed it and even before he could wear it, Dinesh Karthik took it. – 122 runs scored in the last 9 overs is the highest scored by Mumbai in any season. – 2/49 is the second most expensive spell by Ashish Nehra. – 86 runs scored by Dinesh karthik is also his personal best, bettering his previous 69 runs. – 131 runs scored between Rohit Sharma & Dinesh Karthik is the highest for third wicket for Mumbai in any seasons, their previous best was 104 runs. – 131 runs partnership is also the highest for any wicket for this season. – Rohit Sharma scored the 16th IPL fifty and also the joins with Gambhir & Kallis for most No. of Fifties scored in IPL. – Unmukt Chand scored his second golden duck of this season, after being dismissed in the very first game against KKR. Also he is the 16th Victim to be out in the very first ball of the innings. – Dale Steyn bowled the fastest ball of this season clocking 152.48 KMPH bettering Shaun Tait’s 150.19 KMPH. Match 48, Two inform teams meet out to get themselves well set for second position, But it wasn’t the case as rain played the spoilsport and CSK was once again in the receiving end and Duckworth Lewis favoured KKR to win the match by 10 runs. Match 49, Another decider game for Delhi and Mumbai’s game to cement their place in Semi’s. As always Mumbai got off to a good start, following it Rayudu and Rohit Sharma gave the necessary impetus to get Mumbai to their second highest total of this season 178/4. Only Shewag can save them can he do it again, Nope… Delhi was 7/4 in 4 overs and game was over by then and the rest tried to pass time to evade the impossible. Finally its Mumbai Indians who will be the first team to cement their place in Semi’s, which also means that Delhi is out of the context for this season of IPL. Hard luck Shewag…. – 15/2 in the power play over’s for CSK is their lowest ever in IPL history so far and as well for this season. – 4-0-8-2 is the second best economical spell bowled by Lee, best was still Rahul Sharma’s 4-0-7-2. – In this season, there have been two matches curtailed by Rain, and both the time CSK was in the receiving end unfortunately. – Rohit Sharma scored the 400th Six of IPL 4. – Irfan Pathan and Malinga bowled the 21st and 22nd Maiden’s respectively of this season. – Out of 26 times Dhoni won the toss, he has decided to bat first in 20 occasions. – Delhi has been bowled out only twice in this season of IPL and both times credit goes to Mumbai Indians. Coming to Match, Malinga mauled the Delhi and they were dusted in ease with solid performance from Little Master. DD 95/10 in 17.4 overs. MI 99/2 in 16.5 overs. MI WON THE MATCH BY 8 WICKETS. No Price for guessing, and its Malinga’s five which fetched of the man of the match award. Mumbai Indians will be pretty happy in retaining Malinga. Pune Warriors made a memorable debut in IPL, with their skipper Yuvaraj Singh being in the form of his lifetime. KXIP’s new deputy Gilchrist, made misjudgement of the pitch and decided to Bat first in a pitch that offered all kind of help to bowlers, KXIP bundled themselves to 112, Thanks to last minute addition Ryan Mclaren, who waged the lone battle to reach this long. Bowling was obviously good, which kept them under 6 an over. KXIP 112/8 in 20 overs. PWR 113/3 in 13.1 overs. PWR WON THE MATCH BY 7 WICKETS. – Malinga’s 5/13 is the third all time best figure in IPL. Top two were Sohail Tanvir’s 6/14 Vs Chennai in IPL 1 and Kumble’s 5/5 against Rajasthan in IPL 2. – Jesse Ryder bowled the second Maiden of the Season. – Delhi became the first team to be bowled out before completing their 20 overs quota. – Delhi’s innings had 5 batsmen out for Duck, spl thanks to Malinga. – Till today IPL 4 had 9 players out for duck. – Both the Man of match players for the day are Bowlers, Malinga & Wagh. – Pune’s Victory with 41 balls remaining is the third best in the terms of balls remaining, previous two being Bangalore’s 56 balls Vs Rajsthan in IPL 3 and Mumbai’s 87 balls vs Kolkata in IPL 1. Mumbai in a must win situation to see themselves in semi’s, and Delhi, will look to get so closer to that semi’s door. Sachin won the toss and decided to Bat first, But he wouldn’t have expected to come in so early after opting for two new openers, both failing to click and sachin got in at the end of first over. As said nothing went in their way, he himself getting out in a bizarre way, and later in the innings Bravo provided some runs for MI’s to bowl at least for 15 overs. Bowling was fabulous, but fielding woes continued for delhi too… Nehra, Bhatia and Nannes looked classy in their work and did their job. Looking for an target of 116 in 20 overs, Delhi started of the proceedings in slow and steady manner, they seems to be in no hurry to reach the target, they were well convinced to get to 116, with out any pressure, but all of a sudden mumbai pulled in some shock in the name of Duminy and Bhajji’s bowling, which gave a slim hope for MI’s. But its all lost in penultimate 16th over, which really changed the course of the match , where sachin was taken for 19 runs by AB de villers, when the over began its 43 needed of 30, in the end its 24 needed of 24… Which really gave the certain chance to make it up… nothing further cud others do and Ab and Karthik in the end took delhi safe home by 7 wickets…. 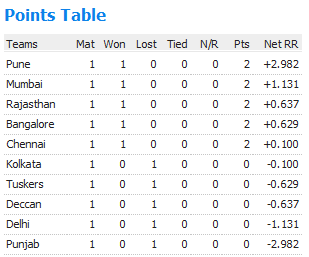 Which also places them right in the top of the table just above CSK and RR. – MI’s Scored their first boundary after 4.2 overs, which is the slowest one as now in the tournament. – MI’s 43 runs of the first ten over is the least by any team in IPL 2009. – AB scored his 3rd fifty today in IPL. – This is first time, both the MI’s openers are out for a duck. – Bravo’s big straight six became the 300th six of the tournament. – Butter fingers continued as today delhi floored 4 chances.